Fill a 12" or 14" pastry bag equipped with either a tip #806 for plain rings or a tip #826 for a ridged effect. Squeeze the dough into alternate rings of the Kransekage set. Be sure to grease the kransekage rings well before filling. Bake in a preheated 325° F oven for approximately 20 minutes or until surface is crusty and golden brown. Three rings on one plate can be made at one time or just two rings -- the outside ring and inside ring. if all three are made at once, the baking time should be increased from 20 minutes to 20-25 minutes. If dough is too stiff to push through pastry bag, add more egg white but only up to 2 Tbsp. Remove from rings as soon as cooled completely. Use the point of a paring knife to loosen the outer edge of cake ring, then loosen the inner edge. It will loosen immediately if baked thoroughly. When making three rings at once, after they are baked and cooled, turn out onto cooling rack. Carefully separate rings in places where they have baked together. There will be only a few places. Care must be exercised in handling large rings as they are tender. Frost and tier as directed below. Mix frosting ingredients together until smooth and well-blended. Place icing in decorating bag into which a small plain icing tube has been inserted. Make drizzles and scallops on top and sides of each ring. This icing holds the tiers together so after the largest ring has been iced, place the next largest ring on it immediately while the icing is soft. Continue to frost and tier the rings according to size, placing a dab of icing here and there to keep rings from slipping. A top decoration may be added, if desired, and decorative scrolls may be fastened to sides here and there, held in place with icing. Sometimes colored sugar bells are added or a tiny wedding or anniversary ornament. 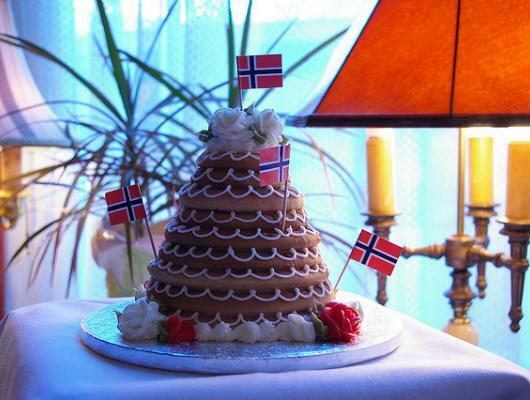 This traditional towering marzipan dessert is often served at Scandinavian weddings and at New Years. The cornucopia-shaped cake (though actually more of a cookie) promises a future of happiness and prosperity. 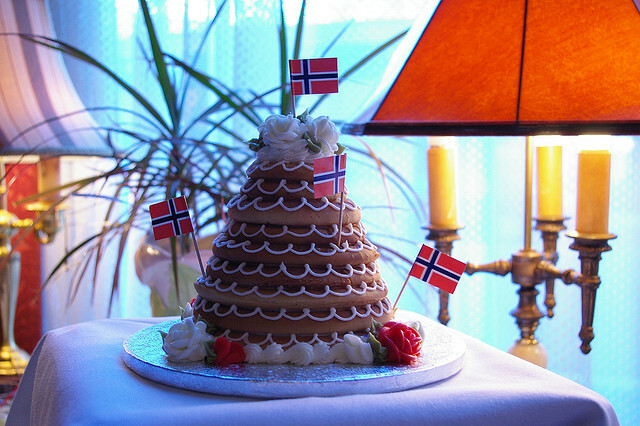 The cake is adorned with little flags and served with champagne at midnight.